ClearTouch Interactive displays are an all-in-one package. They offer an optional onboard PC, an easy-to-install software package, and Ultra HD displays for a state of the art viewing experience. The displays feature true multi-touch capabilities (up to 20 simultaneous points of touch), fast touch response time, high-fidelity audio and an industry leading nine inputs that allow for easy connection to all of the devices in your room. ClearTouch has released their new 6000U Series of panels to respond to the demand for flexible classrooms and more synergistic learning environments. The 6000U Series is Clear Touch’s easiest to use, most intuitive, powerful, and most interactive panel yet. 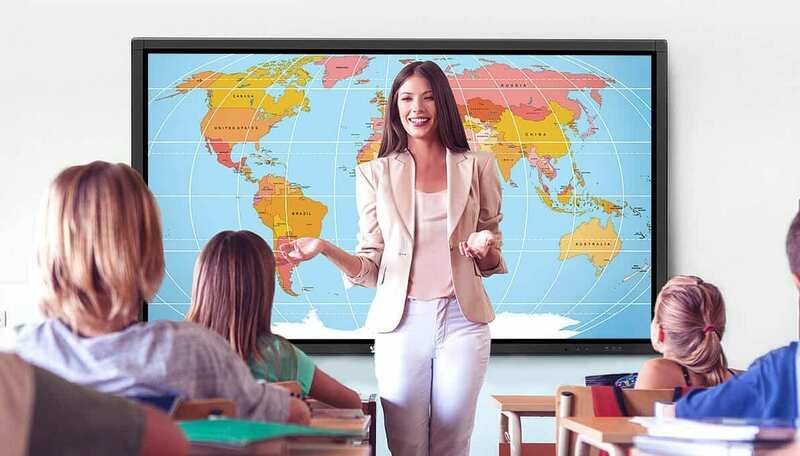 A crystal-clear, anti-glare LCD display with True HD Resolution lets teachers leave lights on during lessons, ensuring all students see the board from any angle. Walk-up ready interaction with a familiar Android interface allows teachers to pull up all of their apps and resources directly from the panel or any wirelessly connected device. The panel, and the teacher, can move freely around the classroom, accessing the network and tools through a built-in PC. Eight to ten students can use the panel at once, creating a better, more collaborative learning experience. Class flow improves, and the interactive panel becomes a learning station in addition to a presentation device. The panels can be mounted to the wall, set on a mobile stand, or set up as a tabletop learning/collaboration station. Connect from any device to any application. Teachers keep using digital resources they’ve created, even on competitor software. Store lessons on the panel or in the cloud and access from anywhere. Teachers and students can connect to the panel from any device through Clear Touch’s Collage software. Walk the room, share screens, switch users with a single touch—keeping the class engaged. With Command, your IT team can see and update all panels remotely from a centralized computer, instead of disrupting classes by going to individual classrooms. Turn sound on with a single touch and adjust volume levels directly on the panel. No cords or A/V expert required. Please contact your LightWerks representative today to learn more about Clear Touch 6000U series!